FALSE BAY, HARO STRAIT — The boats were here, the fish, the biologists, the press. But not the whales. So an effort to feed a struggling young orca whale in an unprecedented effort to save her life were put off Friday, perhaps until Saturday. 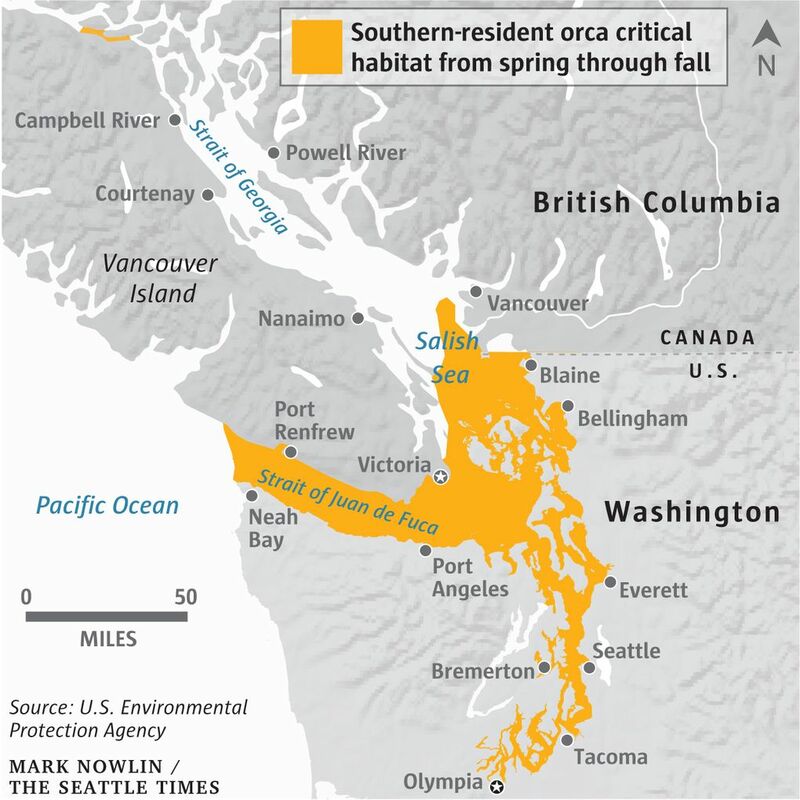 The National Oceanic and Atmospheric Administration has launched a first-ever rescue effort for J50, a 3 1/2-year-old orca who is suffering from malnutrition. Scientists got close enough to her on the west side of San Juan Island on Thursday evening to inject her using a dart, with a long-acting antibiotic. They got a sample of her breath too, and watched her swim and dive, and got a good look at her skin. 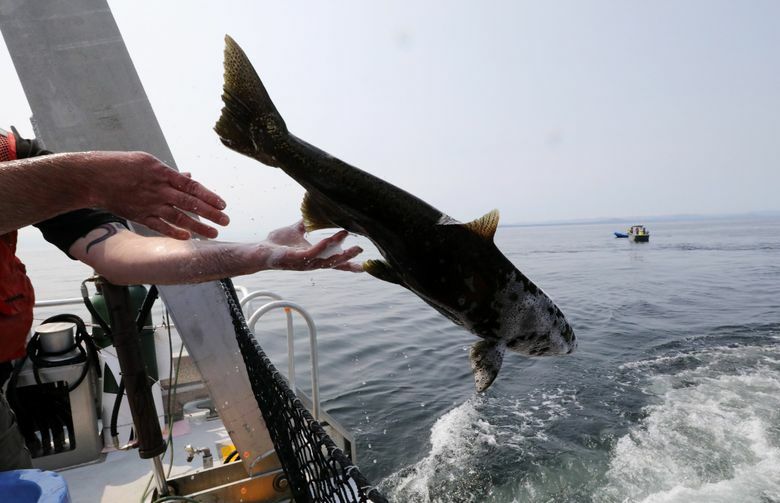 She looked better than they expected, said Brad Hanson, wildlife biologist for NOAA’s Northwest Fishery Science Center in Seattle, who observed her for several hours along with a crew of experts Thursday, including a veterinarian. She was diving and breathing so well, scientists ruled out a respiratory condition as one of her troubles. 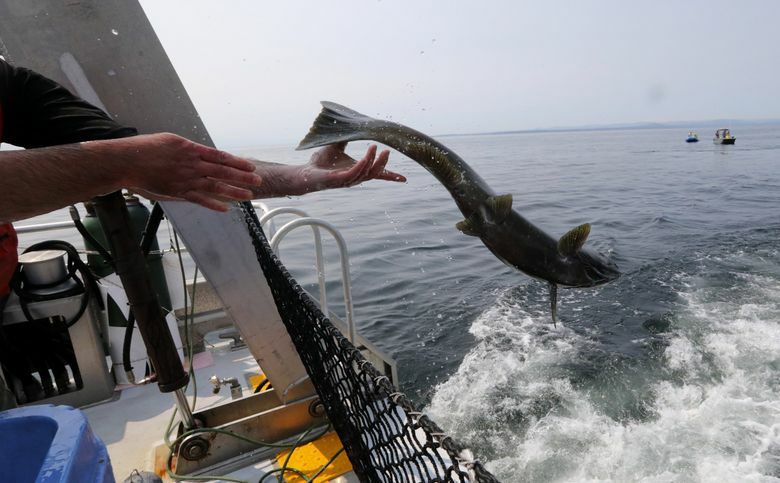 Scientists may try again Saturday to attempt a first-ever feeding of live chinook salmon to the whale. 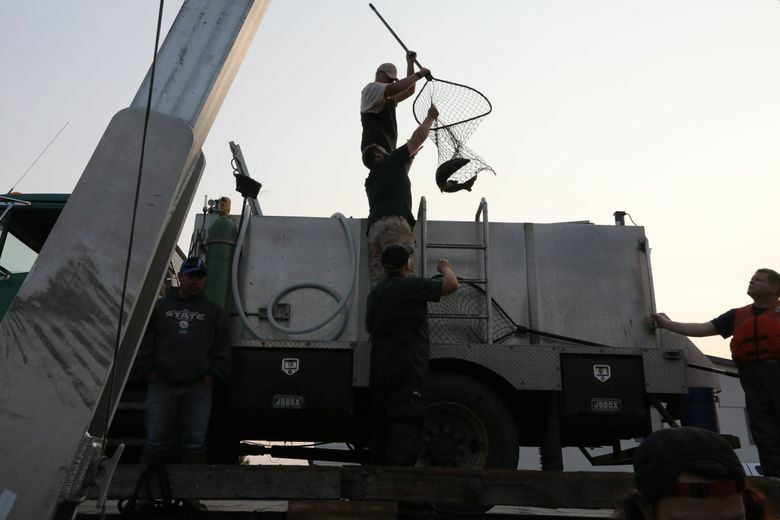 The 5- to 15-pound chinook were trucked to Bellingham from the Marblemount Hatchery and loaded onto totes on a vessel provided by the Lummi Nation, to help feed the whale in an operation that began at Squalicum Harbor at first light. 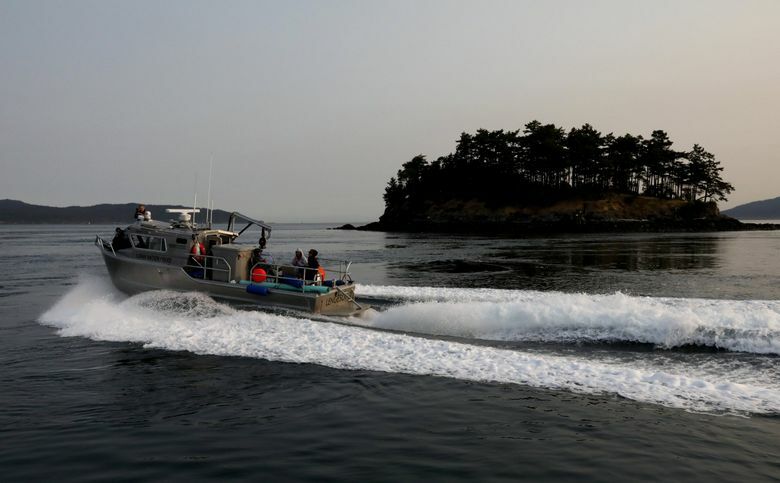 As the sun rose slow, fat and orange, the Lummi Nation law-enforcement boat and the SoundGuardian, King County’s new research vessel supporting the operation, headed off for a long crossing to the west side San Juan Island, a favorite feeding ground of the southern residents in summer — when the fish are around. But Friday the fish on the menu were in totes, loaded on both vessels. 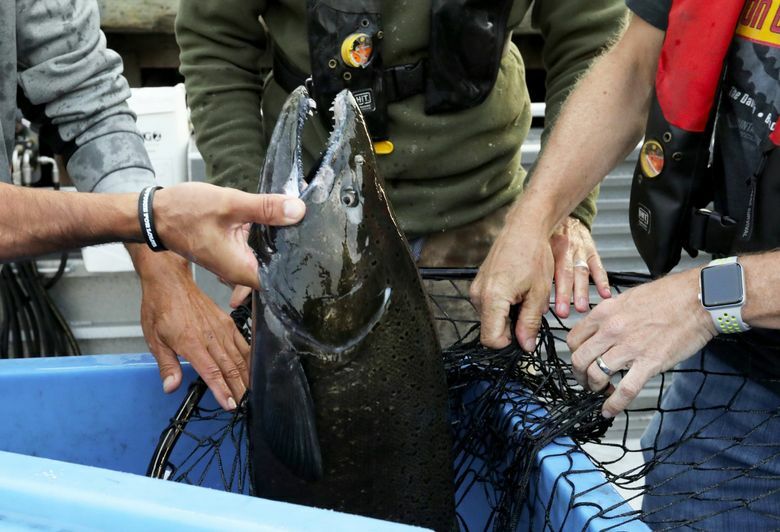 Already turned to their dark, freshwater color, the chinook had recently returned from the sea to the Skagit River, to the Marblemount hatchery. 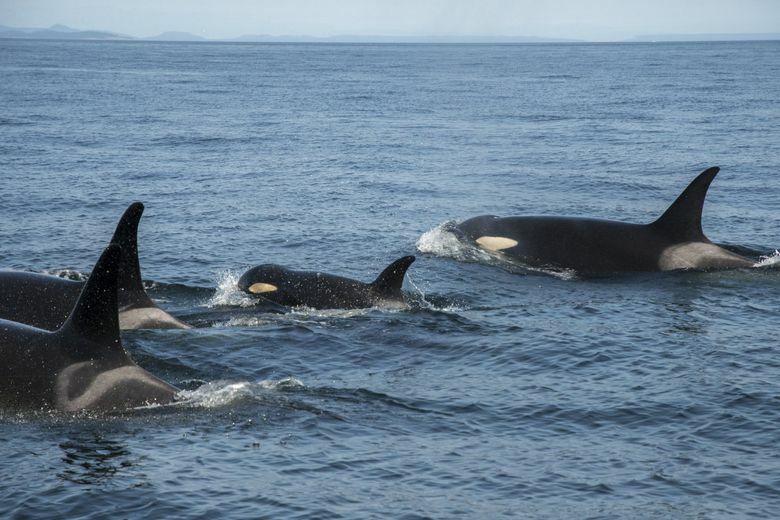 There, the surprise of their lives was waiting for them: Getting plopped back into saltwater — and fed to a killer whale. But it was not to be, as the whales instead remained in Canadian waters, where NOAA does not have a permit to try its feeding experiment. The purpose of attempting to feed J50 live fish is to do everything possible to support a young whale who, if she lives, can produce offspring for a population that’s down to only 75 members and into its third year without a successful pregnancy. Every calf, and every breeding female, or potential breeding female, matters. As the attempt at feeding was called off for the day, Hanson brought the NOAA research vessel alongside the SoundGuardian for an interview, the crew peeling away their orange zip suits worn to protect them in their Zodiac boat. Hanson made it clear the experiment is about more than J50. It’s also about the future, and what NOAA could learn, piloting a new method. A special bell is even being fabricated for use in the experiment, to teach the whales to associate the sound with the NOAA boat, in case animals in the future need medical care, even potentially with medicine dosed in a live fish. 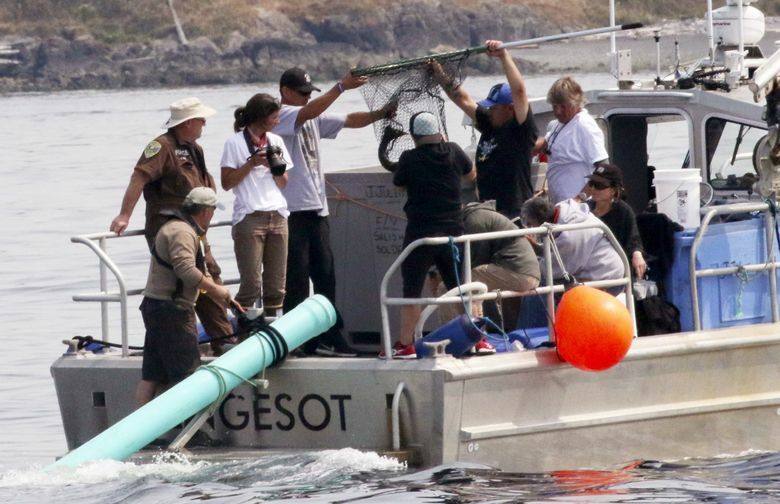 As the whales stayed away, the people decided to give the feeding method a trial run, practicing pitching the fish down a plastic tube off the back of the Lummi Nation’s police boat and into the water. The idea is to place the fish in front of the swimming whale, keeping pace with her as she swims at about 3 to 4 knots, and plopping the fish in the water about 100 meters ahead of her in the hope she’ll chase it down and eat it. Sounds so simple, but it’s a trick to do, fraught with difficulty, between the vagaries of weather, waves and whales. Hanson said NOAA would persist with the effort, evaluating day to day when the time, place and conditions are right to go forward with the feeding operation. Still very concerned about the young whale, they want to keep trying to help. Meanwhile, Tahlequah, the mother whale whose plight, carrying her dead calf for at least 17 days straight, has moved people around the world, was not seen as of midday Friday. No one knew if she was still carrying her calf.